Behutet: The Destruction ofMan. The long awaited final Book in the Behutet Trilogy is filled with exceptional realism and cutting edge authenticity. This isKazembe Bediako at his best - page after page of riveting suspense. 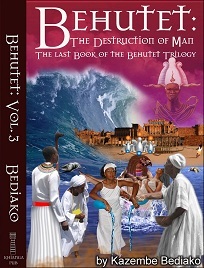 Behutet: The Destruction of Man is an achingly novel of choices and the triumph of life after death. Many characters in Greek mythology conceal the Khamitic and the Cretan origins of Greek civilization! Before the creation of such Greek Heroes as Ares, Poseidon, Zeus, Apollo, Hercules, Agamemnon etc., – there existed the Khamitic legend of Heru of Behutet (Herukhuti) – who symbolized the ultimate victory of good over evil with the guidance of the Metu Neter Oracle! Chillingly current and filled with intrigue, Behutet: the Destruction of Man transports the reader into the most deceiving intelligence organization - Sethe’s Confederacy. Every character has the freedom to choose at life’s crossroads and every character chooses their path. Anuk Ausar. What would you do? How do you know if you are making the right choice? Are you human, or are you divine? The Behutet trilogy is urban Khamitic suspense fiction – a true blend of ancient history with the present – where dynamic characters transcend time. Behutet has skillfully created a new genre integrating Ausarian cosmology into contemporary life. History is being rewritten in front of our very eyes. A long awaited book! A must-read.